Your guide to catching more Zzz’s. Why You’re Here: You and your Zzz’s aren’t cooperating these days, and you really want to hit the reset button. What’s Inside: A bit of a ‘sleep audit’ —a few ideas for evaluating what might be the cause of your restless nights, and some helpful tips for figuring it out so you can finally sleep. How To Use It: Take these tips, but do understand there could be more to your individual needs and you should talk to a professional. Our advice is great, but you need to find solutions that fit your life and your specific environmental or health history needs. 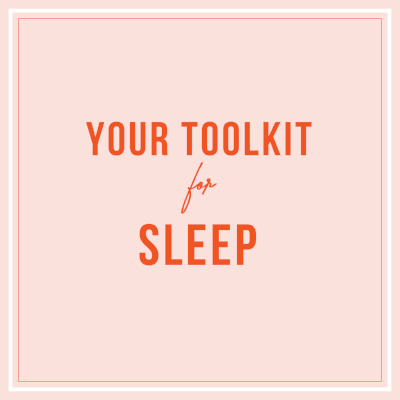 We want you to have deep and plentiful sleep, but you know yourself best. So if anything in here doesn’t fit your needs, that’s all good. Talk to your doctor about what might work best for you. You don’t need us to tell you that sleep is important. We’re not here to lecture - we want to help you master your sleep. Because there are enough things to worry about in life; sleep shouldn’t be one of them. Ask yourself this: Are you sleepy? Answering this can help you navigate a better night’s sleep. There’s no such thing as a ‘sleep bank’. You can’t just overload on the sleep over the weekends and consider it even. What your body actually needs is a regular bedtime and a regular awake time. It helps your circadian rhythm by reinforcing these patterns. The time we wake up is the anchor to our days,and following that helps regulate the circadian rhythm of our bodies. Regardless of when you fall asleep, try to wake up at a consistent time to send your body the cue that it’s time to get up. Try to eat at consistent times throughout the day, and do not eat too close to bedtime. You can also start a relaxing bedtime routine to help improve the quality of your sleep. Set an alarm! Choose a time to wake up that is good for your work or school schedule, and something that is feasible everyday. And if you’ve gotten too used to the default ringtone on your iPhone alarm app, try switching it up with something new. Commit to waking up at this newly set time every day this week, no matter what time you fall asleep. You can adjust your alarm later if you need, but try it for 7 days and see how it goes. Pay attention — whether you think it affects your sleep or not, start to log some key factors each day: what you consume, when you workout, how much screen time you have before bed or any other habits you want to track. You can try bullet journaling to log it all, and then aggregate some data after a couple weeks. If you notice any consistent deterrents to your sleep, look into how you can adjust them. 1. No phones in your bedroom (or at the very least, charge it overnight on the other side of your bedroom). Limit your screen time before you get in bed. 2. If you're having problems staying asleep, eat a high-protein snack like a small tablespoon of almond butter to help level out your hormones. 3. Sure, an evening bath is super relaxing but the real magic happens when you exit the tub. Your body temperature rapidly decreases, causing your heart rate to also slow down and cause sleepiness. (You can also mimic this by setting the thermostat to a low temp). How much sleep you need depends on your age, according to the National Sleep Foundation. Newborns (0-3 months) need 14 to 17 hours per day; infants (4-11 months) need 12-15 hours per day; toddlers (1-2 years old) need 11-14 hours; preschoolers (3-5 years old)need 10-13 hours; children 6-13 years old need 9-11 hours; teenagers 14-17 need 8-10 hours; adults 18-25 need 7-9 hours; adults 26-64 need 7-9 hours. Older adults 65+ need 7-8 hours. What natural solutions can I try to get better sleep? You can try getting an evening or bedtime ritual started before bed to really begin the natural approach to better sleep. Having a routine can help you prepare for sleep, and get you ready for the next day. You can try dropping caffeine, and adding melatonin before bed. Chamomile tea, lavender can also help you unwind before bed. Journaling is also a proven way to try and improve your sleep quality and free your mind before bed. Any tips for dealing with my end of the day racing thoughts? I can’t seem to shut off my brain the minute my head hits the pillow. Try journaling to give your racing thoughts a place to be. Keep a notebook. Write down your thoughts. Come up with a routine that puts you at ease and ready for bed. Forbes also says that if you can’t go to sleep after 20 minutes, and you’re tossing and turning, go ahead and move yourself. Go to another room and try reading a magazine or book. Distract your mind, that way you can hopefully have a reset. Is drinking before bedtime a bad idea? Anytime you drink before bed you are running the risk that you might wake up to use the restroom in the middle of the night. It’s recommended that you stop drinking about two to three hours before bed if you want to avoid those late night bathroom trips.